Fusao, known as Joseph, was a cook at the Pullen House restaurant and Inn between 1910 and 1915 perhaps longer. In 1915 he registered for the draft for World War One. There is no record for him after that. He was born on this day, December 17, 1887 in Kumamoto, Kyushu, Japan. This city is famous for Kawagoe Castle where 21 lords from various clans, all closely allied with the Tokugawa Shogun, resided during the Edo Period. 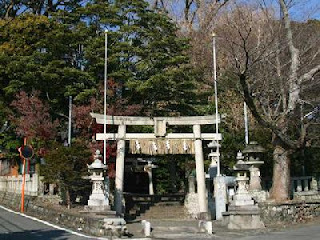 The fuedal age ended in 1868 (remember Tom Cruise in The Last Shogun?). The shrine above is the Toyozumi Shrine in Japan built over a thousand years ago. So Fusao was born twenty years after that, but emigrated to the U.S. in 1906. There were a number of other Japanese immigrants in Skagway in 1910, some worked in the jewelery trade. 1910 census, WW1 registration for Skagway, Alaska. 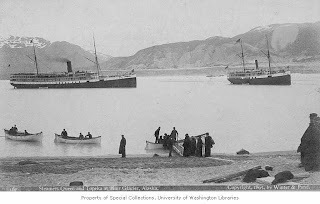 In 1890 the Steamer “City of Topeka” brought 3655 tons of coal to Alaska from Nanaimo BC. 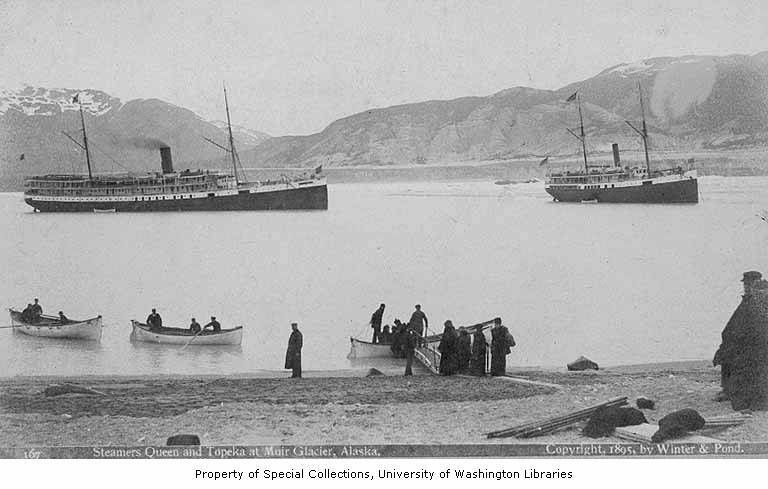 It is seen above, on the right, at Muir Glacier in 1895 when it was bringing tourists to Alaska on cruises. I wonder if they got their towels folded into little animals in their staterooms? There is another rock down near Wrangell call “City of Topeka Rock” which might have been another spot that this poor ship went aground, but I cannot find information on that. First quote is “Marine Disasters of the Alaska Route” – excerpt regarding wrecks in Lynn Canal, written by C.L. Andrews as a plea for the government to install safeguards in the Lynn Canal. 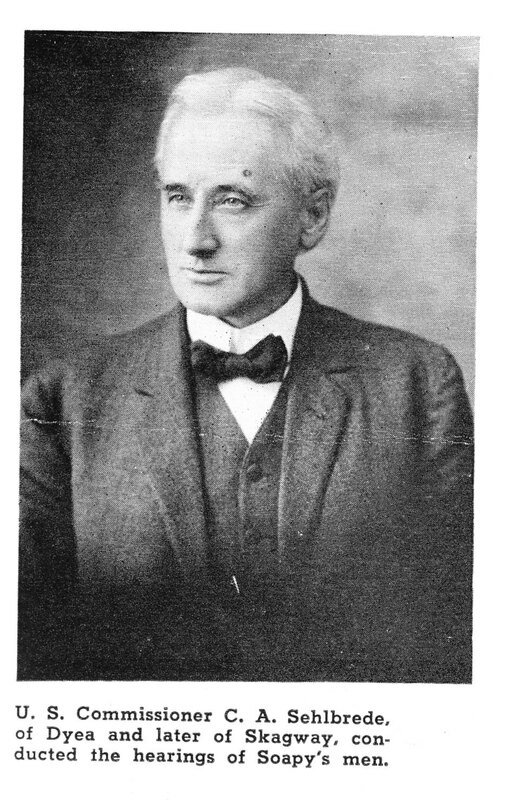 published by the Washington Historical Quarterly 1916. Fred Patten was born in Nebraska in 1873 and Clara was from Wisconsin. They met and married in Auburn, Washington and had a daughter there in 1900. They had moved here to Skagway around that time. Sadly, Clara died on this day, December 14, 1905 of blood poisoning and is buried in the Gold Rush Cemetery. In an attempt to revitalize the town, Fred and Chris led a drive to centralize the town’s business district on Broadway. 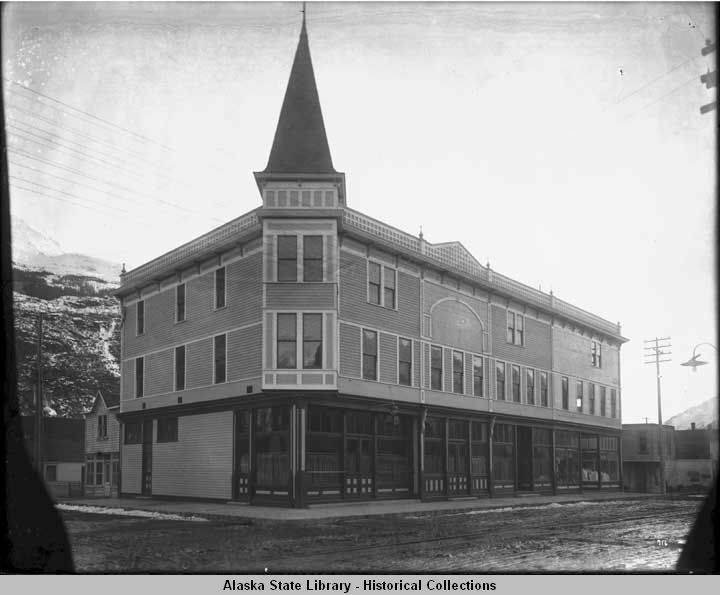 In 1908, Shea and Patten purchased two barracks, sawed the longer one in half, and moved all three to their present location on Broadway. The two halves were remodeled with a new false front to make up the Pack Train Inn and the Trail Saloon. By 1910 they had both moved on. The building currently houses a fur store and a diamond store in the summer and says “U-Ah-to-no” on the side. Allen was born in 1949 probably in this area and worked for White Pass. On this day, December 13, 1969, he was hit by a Casey Car on the railroad and killed. He is buried in the Pioneer Cemetery. 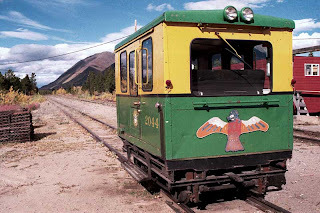 Pictured above is a Casey Car in Carcross. These small cars are used by the Maintenance of the Railroad workers every day. The workers take these cars up the tracks early each morning in the summer to check the tracks to make sure there has not been a rock fall or other damage to the tracks. 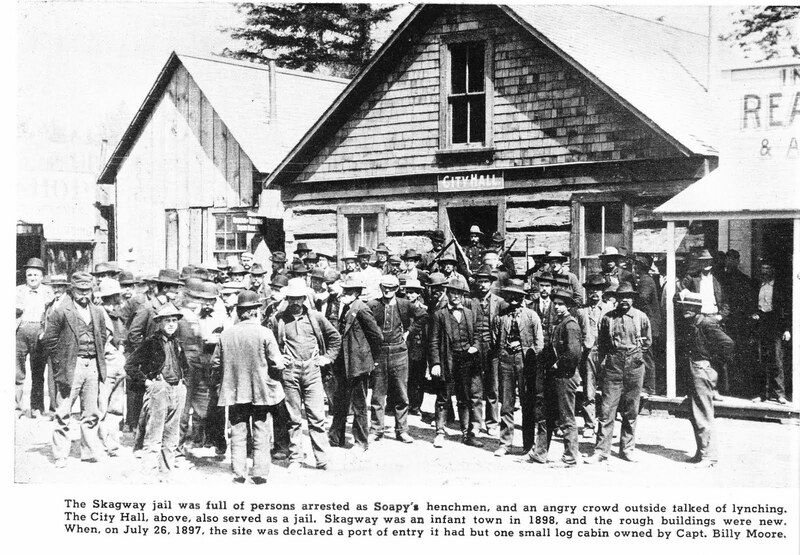 Mary was the daughter of Skagway’s Police Chief in 1907. She was born either in 1882 or 1885. On this sad day, December 11, 1907 three days after giving birth, she died and left behind two newborn twin baby girls: Mary Matilda and Matilda T. Kearns. Her parents, Charles and Matilda Moore brought the girls up. Her daughter Mary M. lived to be 90 and died in Spokane in 1997. Mary Matilda Moore Kearns is buried in the Gold Rush Cemetery. The photo above is from 1911 but is not of Mary and Matilda, just a couple of twin girls with a Buick Speedster somewhere else, but is a good depiction of the time. Unbelievably this building is still standing and I walk by it each night on the way home. It is falling apart and it is a shame that the city or the park service doesn’t buy it. Charles was a member of the Yukon Order of Pioneers. He was an early gold rusher coming to Skagway about 1893. He went on to Hunker Creek and Bear Creek, and made gold claims. He met a nice German lady in Skagway about 1897, Carolina Bernhoeffer. 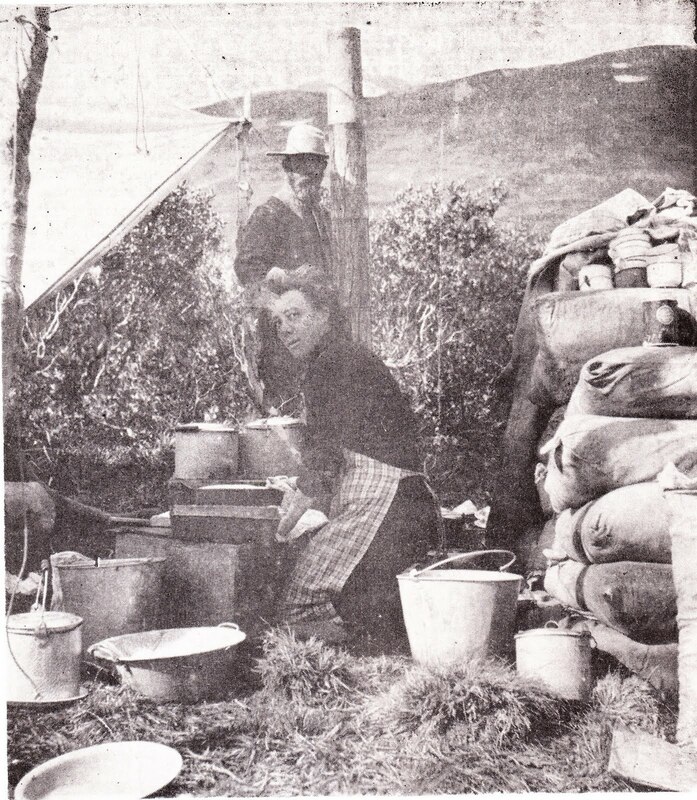 She and her sister Mary (see earlier blog) ran the hotel “New Home Restaurant & Lodging house”. Carolina may not have ever been married. In any event, she went with Charles to the Yukon and was recorded in 1901 living with him there. They must have married soon after. Carolina was known as “Dutch Lena” and ran several hotels including the Hotel Skagway 1898, Bernhofer’s Roadhouse, Klondike 1901, the Travelers Home in Bear Creek in 1904, cook for Rigley & Templin in Council Alaska in 1905, and washer for Cascade Steam Laundry in Fairbanks. 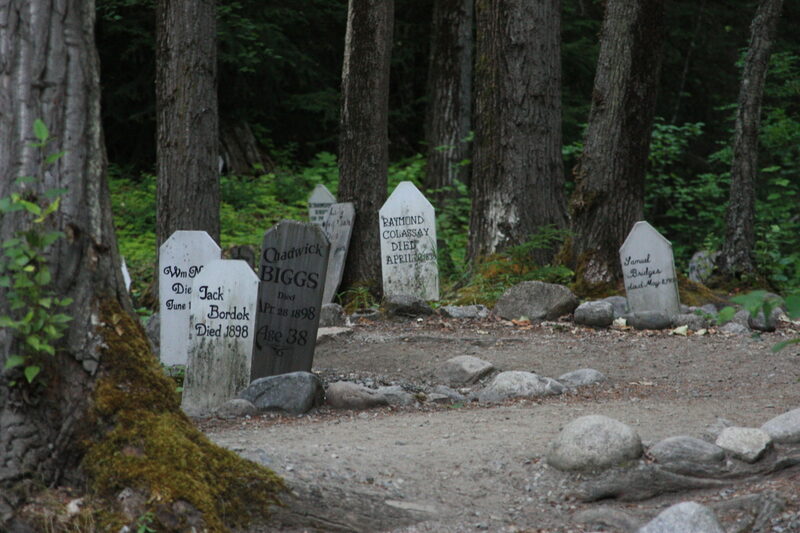 Carolina Hilty died in Skagway in 1906 and is buried in the Gold Rush Cemetery. I blogged on her earlier before I found the connection with Charles. I believe there are some errors on the headstone. Meanwhile, Charles got into a shooting scrap in Tanana, Alaska and the Pioneers advanced him $1000.00 for lawyer fees. He was acquitted and repaid the money. The Yukon Order of Pioneers motto was “do as you would be done by”. It was formed during the Gold Rush era to ensure stampeders’ rights were protected. Charles Hilty died on this day, December 9, 1920. Yukon Genealogy site; 1901 Yukon census Volume YRG1 page v76 as posted also on the Yukon Genealogy site; Gold Fields of Alaska online no date. Born on this day, December 8, 1880 in Gresham, Oregon, Bates Shattuck was one of 5 brothers: Allen, Henry, Dudley and John who came to Alaska at the turn of the century. 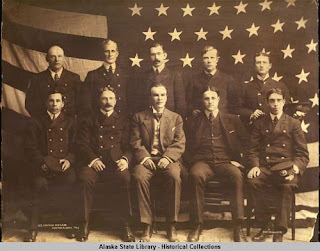 Most settled in Juneau, but Bates was the U.S. Customs officer in Skagway in 1904. 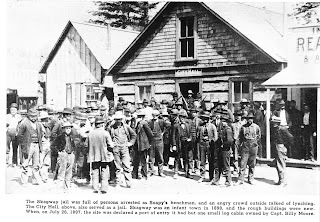 Apparently Skagway was not his cup of tea as he went back south to Oregon that same year. Seen above are the other Customs officers in 1906. Remember that Skagway has been the Port for the Yukon since the railroad was built in 1898. The U.S. Customs has kept a similar number of employees year round since then. This time of year both the U.S. and the Canadian Border and Customs offices are only open from 7 am to midnight, but in summer are open 24 hours a day.